Where do you go to get the most Halloween candy? After coming up with a suitable costume this question was a key topic in our house for many years. The answer was important to my children because I try to never buy them candy. Their primary source of candy was this one holiday. If they got a large enough haul at Halloween, they might have enough candy to last till next Halloween. We lived in a town that was perfect for experimenting. The town was divided into neighborhoods which were separated by large and busy main roads. The north neighborhood had mansions and millionaires. The central neighborhood was upper middle class. The south neighborhood (where we lived) was lower middle class and as you approached the very southern border poor. What made the town great for experimenting was that it was possible to walk to all the different sections in a single night if you were interested in answering the question “where do you go to get the most candy?” and were not interested in simply collecting. By visiting all the neighborhoods in one evening, variables like weather, economic conditions and the particular day of the week were all taken into account. I was able once to convince my children to test all the neighborhoods. I did it by a combination of telling them that finding out the answer was important for all their future Halloweens collections and by promising to buy enough candy to make up any shortfall. The results were pretty clear and are summarized in the below picture. 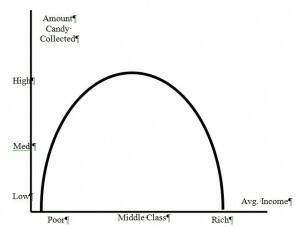 The graph has the average income of each neighborhood on the x-axis and how much candy would be collected on the y-axis. The data suggested an upside down u shape. What does that shape tell us? You never want to go Trick or Treating in the richest part of town. First, many people were not home. More importantly, it took a long time to walk between the homes and a long time for people to answer the door because their homes were so large. While the candy tended to be more expensive and larger, the haul from the rich part of town was relatively low. You also didn’t want to go Trick or Treating in the poorest part of town. Like the richest part of town many people were not home. Those that were home gave out small pieces of candy that were often not very tasty or exciting. The best part of town was the lower middle class neighborhood. The area that had homes packed closely together provided the ability to ring a large number of doorbells quickly. More importantly, because lots of children showed up there was often no waiting for someone to answer the door. While the candy was not as fancy as what was given out in the rich neighborhood, the vast quantity more than made up for slight change in quality. While I have not rerun the experiment again, I am interested in knowing if your experiences matched mine. Today’s Wall Street Journal has an interesting article in the Heard on the Street section of the newspaper. The article leads off with these sentences. The article goes on to say that the money boosting stocks is coming from municipal bonds, which investors are fleeing in droves. The idea that money going into stocks has to come out of another asset class is wrong. It is wrong because investors can borrow money to invest. Let’s say you have $1,000 invested in stocks and $1,000 invested in municipal bonds. Suddenly you believe that stocks are going to rise in value and you want to invest $2,000 in stocks. You could, like the article suggests, sell all your municipal bonds and use the money to buy stocks. However, you might simply take out a $1,000 loan, use the money to buy more stocks and not touch the municipal bonds. In short a new dollar being invested in stocks does NOT have to come from another asset class. My post on Oct. 13th entitled “When Will the Shutdown End?” predicted that the shutdown should have ended 4 days ago. The government shutdown did not end when I predicted it would and at present there is no end in sight. This reminds me of the old joke. Question: What is an economist? Answer: Someone who has predicted 14 of the last 2 recessions. The US Treasury Department is warning that on Oct. 17th the government will run out of money and be unable to pay its bills unless the debt ceiling is raised. The news is full of extremely dire warnings about the consequences of a default. One story is found here. As a macro-economist I am both concerned and amused by the dire warnings of global collapse. Numerous countries around the world have defaulted in the last 100 years. Many Latin American countries have defaulted multiple times. For some the default caused severe economic pain but for others the pain seemed to have been inflicted primarily on large outside investors and had little impact on the lives of ordinary citizens. I remember the panic and concern that occurred over Y2K. People were very worried that dates changing from 1999 to 2000 would cause wholesale computer failures. I was concerned and stockpiled large amounts of water, food and cash. I did this because of what happened at a computer company I worked with during 1998, two years before Y2k. The head of engineering was a very smart guy. He said, let’s just test out what will happen when Y2k rolls around. One Thursday just before lunch he arraigned for every computer in the company to have its date reset to 30 minutes before Y2K. Then everyone in the company went out for a big lunch celebration at a local Chinese restaurant. We went back to work after lunch, every computer had crashed and a few had crashed so severely that it took hours to get them rebooted. This showed me that Y2K was a real and severe threat. It lead me to stockpile. This exercise, however, was repeated not only in our company but in companies across the globe. The result was that Y2K was a non-event and I ended up eating for a long time a supply of relatively tasteless canned food. There are no good macro-economic models for what happens when the US Treasury defaults on its debts but my experience with Y2K suggests the only way the default will cause the massive problems that the news is currently hyping is if banks, investors and the Treasury all do absolutely nothing. Given both people and institutions are pro-active when faced with an impending problem my feeling is that a default on Oct. 17th will cause some issues but not the end of capitalism as we know it. I hope we will never know if my guess is right or wrong. No one can predict the future. If I could I wouldn’t be teaching but instead making lots of money trading stocks. That said, my best guess is that the shutdown cannot last more than 3 weeks but likely will last 11 days. Why 11 days? Because while the shutdown occurs all federal paychecks are not being processed. The next federal pay day is October 11th. To see when Federal employees get paid look at this link. Many of the people who work as air traffic controllers, federal prison guards, airport screeners, FBI, CIA, etc. get paid every 2 weeks by direct deposit (also called EFT – Electronic Funds Transfer). If these people don’t get paid on the 11th, many will call in sick and key functions will grind to a halt. No politician wants to be seen as the man/woman who allowed federal prisoners to riot, planes to crash or terrorists to plot an attack because they were grandstanding on TV about health care reform, which is why I believe the shutdown has to finish around October 11th. Why Did the Stock Market Rise When the Government Shutdown? Yesterday, the USA government shutdown all non-essential services. This was front page news around the world. The USA stock market, however, had a pretty good day with the Dow rising 0.4%, the S&P rising 0.8% and the NASDAQ rising 1.2%. Why did the stock market rise when there was bad news from Washington? Explaining why the stock market rises and falls is almost impossible and there is a good chance what I say below (and what anyone else says) is wrong. With that caveat in mind I think the market rose for two reasons. The price of stocks fell the week before the shutdown as traders were uncertain if the shutdown would occur and many traders used worse case scenarios for predicting future profits and sales. Once the shutdown happened traders were able to better predict future spending (or not spending) by the government). This enabled them to change their profit predictions from the lowest to something a bit more certain and higher. These higher predictions of future profits resulted in the market rising. A second and probably smaller reason is that Obama Care is good for large companies. Obama Care raises the cost of hiring workers since businesses now must pay for an extra health insurance benefit. Almost all large companies are already providing health care to their workers so Obama Care has no impact on them. However, Obama Care makes it more expensive to start a new business. The higher the cost the fewer new businesses are started. This reduces competition, enabling large publicly traded companies to make higher profits. Higher profits means a higher stock price. Welcome to my blog. Today (October 1, 2013) the USA government has shutdown due to a budget impasse. For me the key question is what will be the economic impact? The economic impact depends on something called the “fiscal multiplier.” In simple terms the fiscal multiplier shows the total impact of federal spending on the economy. Each dollar of government spending typically does not have just a single dollar of impact. There are two beliefs. One side believes the fiscal multiplier is greater than 1. This side of debate states ideas like government workers use their salaries to buy food, housing and clothing in their communities. This means that government workers by spending their paychecks indirectly cause employment to rise in the communities where they live. The other side of the debate believes the fiscal multiplier is less than 1. This side states ideas like new government programs stifle the economy by imposing all kinds of burdens. For example, there are many stories in the news that Obama care will lead to the private sector cutting back on jobs because they cannot afford the health insurance mandated by the new law. Why is knowing this number important? Because if the multiplier is less than 1 the optimal situation is to reduce the size and scope of the government. 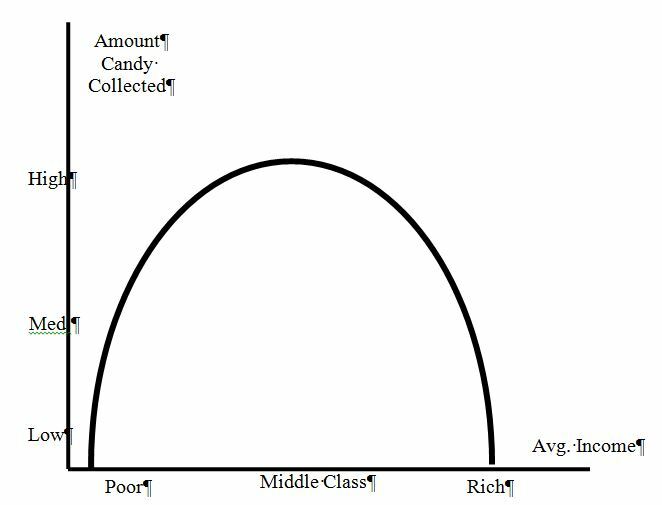 However, if the multiplier is much larger than 1 (say 3) then the optimal situation is to have a large amount of government spending. In the 1990s Alan Blinder wrote a short article (http://www.jstor.org/stable/2950924) that stated most economists believe that the fiscal multiplier is greater than 1. My personal belief is that the current (2013) fiscal multiplier is greater than 1, but only by a small amount. Time will tell if this belief is right.